My first Broadway musical was Mary Poppins and out of all the shows I’ve attended, it has always been my favorite. Until last night. Lion King is now in the number one spot, followed by Mary Poppins. 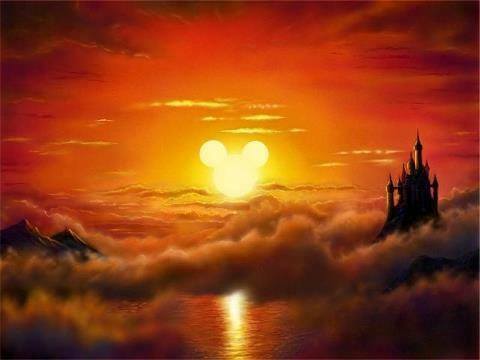 Credit goes to Disney for creating their signature magic in both of these amazing stage productions. 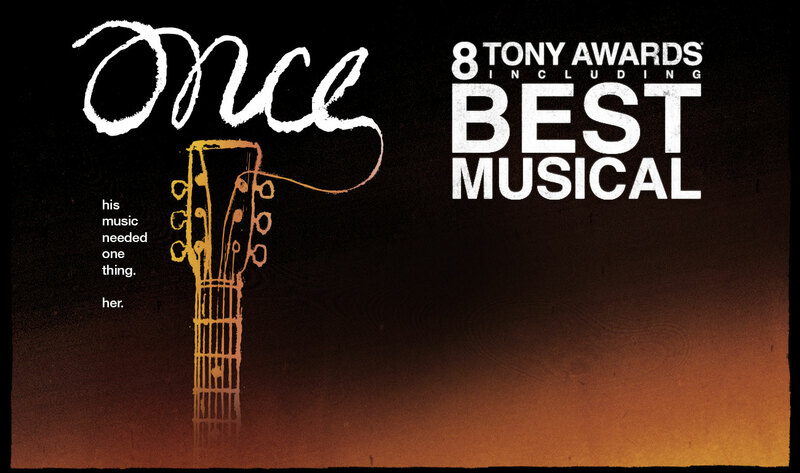 Obviously, the music is a big part of any Broadway musical, hence the name. But, we all know that Disney hit it out of the ballpark when they enlisted Elton John and Tim Rice to write the songs. I’ve been an Elton John fan since the first time I heard him sing Your Song, but to hear the emotions of songs like Circle of Life and Can you feel the love tonight, live and surround you in that old, beautiful theatre, was a memory that will never be forgotten. I know I’ve talked about magical nights before, but Lion King was the epitome of all magical nights. 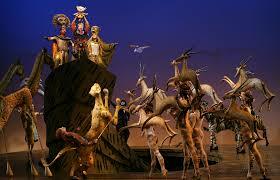 This production of the Lion King brought cheers and shouts from the audience and a standing ovation at the end. I think it’s partly because we all know and love the characters and know the story-line so well. But, what really sets this show apart from others is the costuming, the colors and the artistry. That’s how I viewed the giraffes and birds and even Scar’s hyenas…as art. The puppetry is different from anything I’ve ever seen with live actors portraying wilderbeasts, zebra and even the African savannah grasslands. At one point, a procession of these animals make their way up both aisles of the theatre and take the stage while the drums beat strongly and the harmonies fill your heart. I can’t tell you how many times during the night I had goose bumps and you know I cried buckets of emotional tears. Rafiki was one of my favorite characters and in this perfomance, Rafiki is portrayed as female, and the actress, who plays the wise baboon did an absolutely brilliant job including an engaging tirade that including the famous clicks of some African languages. No one understood a single word she uttered and yet, we all knew exactly what she was saying. Amazing performance. I was also very impressed with the young actors that portrayed Simba and Nala. When I see young people already living their lives in such an artistic and meaningful way, it gives me great hope for the human race. One thing occurred to me last night as I sat mesmerized and enchanted and felt my heart expand and my capacity for love for my fellow earthlings increase ten fold. We should expose the people in this world that perpetrate hate and violence to shows like this. I can’t imagine anyone, no matter how evil, watching this show and not feeling changed for the better. 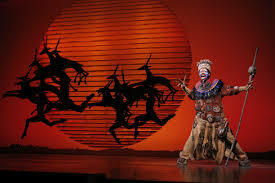 The story line for the Lion King is one of my favorite with the underlying theme being courage, bravery and love. The best ones are always all about love. Thank you to Disney and the marvelous cast of this show for showcasing it so well. This was my last show at The Orpheum Theatre in Memphis. I had moments last night that I wanted to feel a bit sad, knowing how much I will miss this old place. But, how can I feel anything but grateful? I’m so grateful that my bestie introduced me to Broadway musicals and that I got to feel the energy and excitement for more than two years. I’m thankful that for a city the size of Memphis, that there are enough people that care about the arts and stage to continue to bring these caliber of shows to The Orpheum. I’m also forever grateful for all the magical memories I’ve got stored away for the less than sunshiney days. What a way to end a run……. There are times in your life when you get to experience something that changes who you are. Last night, I had the priviledge of getting to see, Andrew Lloyd Webber’s The Phantom of the Opera at the beautiful and historic Orpheum Theatre in Memphis. I have seen both movie versions and anyone I’ve spoken with has told me what a magnificent production this musical brings to stage. I thought I was prepared, but I was not. I walked into the Orpheum last night expecting to be dazzled and amazed and the show did not disappoint. It was bigger than anything I could have imagined and the music was magical all by itself. The Orpheum Theatre underwent a 10 million dollar renovation back in 1996 so that they could bring shows of this size to Memphis. I for one, am very appreciative and impressed like always that Memphis and more specifically, Pat Halloran and The Orpheum Theatre have worked so tirelessly to lure these Broadway productions to our little city. My first musical was Mary Poppins and it was a show that will always be at the top of the list in my heart of favorites, but The Phantom of the Opera shot straight to the top with it’s beautiful costuming, elaborate sets, superb story-teling and haunting melodies. The Phantom of the Opera is based on the book by Gaston Leroux and was first published as a serialisation in France in 1909. I grew up seeing the 1925 Lon Chaney version once or twice and then I finally got the see the 2005 film version a couple of years ago. The older film version is a classic Universal monster movie with plenty of bad acting and a story line that while consistant is very predictable and boring. I never once thought of the movie as a love story until I saw Andrew Lloyd Webber’s version starring Gerard Butler and Emmy Rossum. When I saw Phantom at The Orpheum last night, I saw a part of the story that I had never felt so strongly before. Not only is it about love and obsession, but it’s about the unfairness of life and the heartbreak it can hold. There’s a scene in a cemetary that Christine sings to her dead father, and the words to that song, “Wishing you were Somehow here Again” made my heart ache in such a powerful way. And each time the Phantom would sing to Christine, I fell in love with the monster and understood his anguish and his psychoses. Towards the end of the show, the Phantom is finally unmasked and the monster beneath is revealed and though horrifying, it was so human in it’s portrayal that it’s marked my heart forever. When he kisses Christine and she kisses him back, I sobbed in my seat. 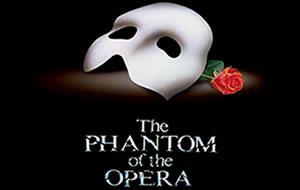 The Phantom had never been given a kiss or allowed one to be given back, not even by his mother. The absolute humanity in that scene from both actors could be felt all the way up to balcony center. A triumph for the human race. I know some of you will laugh at me when I tell you that this show changed my life last night, but there are some of you who know me well enough to know that I believe that life is an ever evolving, ever changing experience and that the only true purpose in life is love and how you give it and receive it. The human heart is the most profound and important thing that we possess and when you spend three hours watching a rendering of ourselves in our most human, basic form and you also put that together with a live orchestra, extraordinarily talented actors and lyrics that simply pull at your soul, you have a life changing experience.